Though we are small in number we have a unique twofold ministry here at Grace. Ministering to vacationers’ and knowing how to reach our local community with the Gospel. How to reach the local community is heavy on our hearts and I feel it is on our Lord's heart too. You see, if you went to Church last Sunday you are quite rare in Vermont. Why, because Vermont is the least religious states in our country!! We are praying that in the future we will have more local visitors than vacationers. However, in order for that to happen it will require a great movement from God on the hearts of God’s people. We need a heaven sent revival that transforms the hearts of those that already attend church, which will usher in a great spiritual awakening in a culture apathetic and nonresponsive to the life-changing Gospel of Jesus. You may be thinking, how can I help and if you are, let me give a few suggestions. 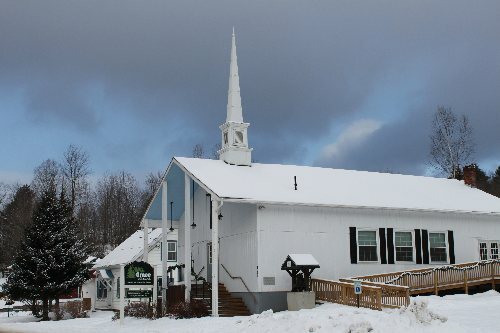 First of all and foremost pray that God will send a great revival to the northeast, and especially Grace Bible. Secondly, ask God how you personally can be involved. If you are not serving Jesus in a local church we need your help! God is more concerned with our availability than our ability. We are not pond fishing at Grace. We are stream fishing. We are not trying to get members from local churches or tell them what they should believe. We are stream fishing. Jesus said, the harvest is plentiful, but the laborers are few. If you live locally, come help us. If you’re a vacationer, who gives to the ministry of Grace Bible financially, we thank God for your faithfulness. Vermont and the northeast are one of the greatest mission fields in our country. There are lost souls all around us. God may be sending you here to labor with us as we fish for men. Come help us catch’em and we will let Him do the cleaning! Though we hold to fundamental, conservative evangelical doctrines we are not legalists. We are Grace Givers!! We also cooperate with other ministries so that we may accomplish the task of the Great Commission both locally as well as globally. Lamoille Community Food Share is to help support and improve the physical well-being of individuals who might otherwise go hungry. To this end, we provide supplemental food free of charge in a supportive environment, striving to offer healthy choices within our budget. We help all those who ask, but our main service area consists of the towns of Eden, Elmore, Hyde Park, Morristown, Stowe, and Wolcott in Lamoille County, Vermont. Baptist Convention of New England - To really understand the scope of work in the Baptist Convention of New England, one must realize that only 300 churches and mission church plants exist to serve all six states. This has been the work of many sacrificial servants, missionaries, pastors, and pioneers over the last 50 years. New England is divided in to 7 Associations. Each association is responsible for their own church planting strategy for their own context. At the BCNE, we help resource and assist in any way that we are called upon. We attempt to work together as partners to accomplish such a large task for any one group. Challenges are everywhere, and with God’s great grace we will prevail. Gideons International is an Association of Christian business and professional men and their wives dedicated to telling people about Jesus through sharing personally and by providing Bibles and New Testaments. While we are known worldwide for our work with hotels, we predominantly share Scriptures in schools and colleges, prisons and jails, hospitals, and medical offices.